having the capacity to accurately predict the utility of proposed policy—whether it be domestic legislature or multilateral agreements—in real time while discussions are ongoing, opens the door for an entirely new way to enact policy. 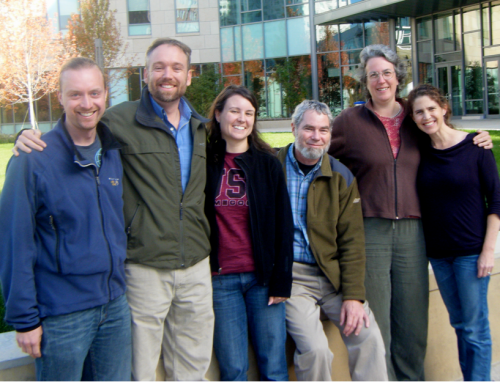 The ClimateInteractive team: Travis Franck, Drew Jones, Stephanie McCauley, Phil Sawin, Beth Sawin, and Lori Siegel. Many other partners have also been instrumental, including John Sterman (MIT), Peter Senge (SOL), and really too many others to mention. •	Building your network of people sharing aspirations for climate progress. We will stay connected and collaborate to accelerate progress. In Boston, Oct. 18-20, Climate Interactive and Seed Systems will be running a workshop on C-ROADS and climate leadership. Systems thinking: Causal loop and stock-flow diagramming. Leadership and learning: Vision, reflective conversation, consensus building. Computer simulation: Using and leading policy-testing with the C-ROADS/C-Learn simulation. Policy savvy: Attendees will play the “World Climate” exercise. Climate, energy, and sustainability strategy: Reflections and insights from international experts. Business success stories: What’s working in the new low Carbon Economy and implications for you. Build your network of people sharing your aspirations for Climate progress. Scott Johnson asks about C-LITE, an ultra-simple version of C-ROADS, built in Processing – a cool visually-oriented language. (Click the image to try it). 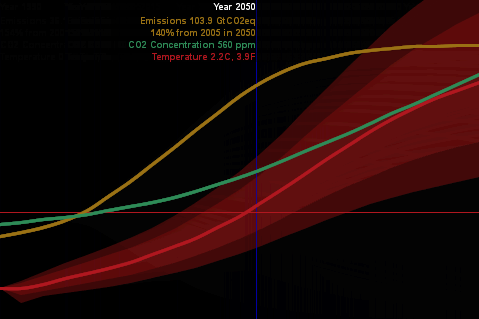 A reduced-form version of the climate model, with “good enough” accuracy and interactive speed, as in Vensim’s Synthesim mode (no client-server latency). Tufte-like simplicity of the UI (no grids or axis labels to waste electrons). Moving the mouse around changes the emissions trajectory, and sweeps an indicator line that gives the scale of input and outputs. Pervasive representation of uncertainty (indicated by shading on temperature as a start). This is just a prototype, but it’s already more fun than models with traditional interfaces. The only hassle is that equations have to be ordered manually. I built a Vensim prototype of the model halfway through, in order to stay clear on the structure as I flew seat-of-the pants. The scoreboard widget just hit 1000 installs and 90,000 views. Janice Molloy has a nice perspective on the use of feedback to change the world, on Leverage Points. This is a spinoff of our work with C-ROADS: a shareable tool that presents the outcome of current climate commitments in a simple way.